A city with museums, nature and parks and several interesting places, landmarks and outdoor activities. As many different sites are not really close by or at walking distance we advise to rent a cheap car to move around Doha. As the capital of Qatar, Doha is growing at a great pace and a lot of money is being used to construct and improve the city. It has been estimated that Doha will be the main urban development in the country in a few years time. Exploring this part of the Middle East is so much easier with the convenient car rental services. The Al Koot Fort was built during the Ottoman period. The building today stands in the parking lot of Souk Waqif. It is closed but visitors can still take photos. 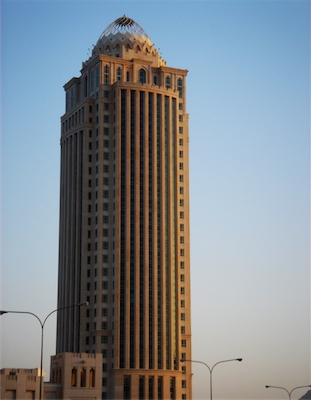 Head over to the clock tower where one can enjoy breath-taking views of the Corniche. This tower is located beside the Grand Mosque and the numbers on the face of this clock are in Arabic. Doha heritage village is located in the Al Rumeillia Park. This village has been created to depict the tradition and culture of a real and original Qatari village. Here you can see weaving and pearl trading among many other traditions. A lot of festivals are celebrated in this village and visitors can spend time hunting for souvenirs here. Souk Waqif is a renovated market quarter and one can easily spend hours here looking at the items on sale. In Souk Waqif, shops are arranged in different sections. There are spice shops, textile shops and various other sections. Car hire makes it so much easier to shop for souvenirs as you do not need to carry your purchases with you all day. The town of Al Zubara is famous for its fort, the Al Zubara Fort. Al Zubara Fort is actually a museum now; it was a fort when it was built in 1938. The fort is square shaped and there are three round towers in three corners while there is a rectangular tower in the fourth corner. Kids will love to visit this fort as it really captures the imagination. The heritage library is one of the biggest research centres in the Middle East and it was started in 1979. Currently the library has thousands of books, maps and manuscripts and is a great place to find out more about the history and culture of the region. The Corniche is a visual delight in Doha. It is a seaside promenade that offers picturesque views of Palm tree Islands. The Corniche becomes crowded in the evening with locals and tourists and is a great place for jogging and walking although cycling is not allowed here. On Friday mornings the place is rather calm and less crowded. Doha car rental can ensure that every attraction that is on your wish list is within your reach during your stay in the city. The local time code for Doha is AST. When traveling to Doha make sure to check the local weather conditions in order to avoid any unpleasant surprises. When traveling we advise to carry some Rials to avoid any unwanted surprises. At Doha airport there are Money Exchange offices in order to change your local currency. Doha has approximately 1,351 million inhabitants. Doha Airport is a popular rent a car destination, there are many car rental companies in Doha Airport with a wide range of different car categories. Many of our clients have rented a car in Doha Airport and had good experiences. Do not wait with booking your car for Doha Airport before you know prices will go up and the availability will get low. Last month, the average car rental length at Doha Airport was 1 days. The average rental car length at Doha Airport is 3 days. The most booked rental car type currently at Doha Airport is MINI cars. Last year, the most booked rental car type at Doha Airport were ECONOMY cars. How much does it cost to rent a car at Doha Airport? Last month, the average car rental price was 23 USD. Last year, how much did it cost to rent a car at Doha Airport? Last year, the average car rental price was 131 USD. What is the current average daily price to rent a at Doha Airport? Last month, the average rental price was 23 USD per day. How much did it cost to rent a car at Doha Airport over the past 12 months? Last Year, the average rental price was 45 USD per day. The car rental companies available at Doha Airport are: Alamo, National, Thrifty. See below last 5 customer reviews. Our customers rated Doha Car Rental with an average of 9.00 based on 4 ratings. The car was fine, although it had less than a quarter tank of fuel at pick up, the rear seat was pretty dirty, and we had to pay for the parking as the ticket had expired.rnthe staff were very curtious and helpfull. Everything went well and simple. An advice to the qatar go rent a car: please advise customer clearly in the confirmation email that you do not have a desk at the car rental area of the airport, and the fact that your representative will meet at arrival.